Designed to be fully-submersed in grain until the sweep is needed to finish the unloading process. Offer options for zero-bin-entry use. MAVERIK® 4000 Series Sweep - Proven for heavy commercial duty, Brock’s MAVERIK® 4000 Series Sweep offers variable-speed technology, single- or dual-arm sweep options as well as hydraulic-powered augers and sprocket-and-ring track drive. Bin diameters: 60 to 132 feet (18.3 to 40.2 m). Auger diameter: 12 inches (305 mm). Capacities range up to 15,000 bushels (381 metric tons) per hour. See the MAVERIK® 4000 Series Sweep video. 3000 Series Sweep - Designed for medium to heavy commercial duty, Brock’s 3000 Series Bin Sweep offers models with either a tractor drive or a sprocket-and-ring track drive. Bin diameters: 30 to 105 feet (9.1 to 32 m). Auger diameters: 12 or 16 inches (305 or 406 mm). Capacities range up to 10,000 bushels (254 metric tons) per hour. Choose to watch either the 3000TD Series Sweep video or the 3000SR Series Sweep video. 2000 Series Sweep - Engineered for heavy farm to light commercial duty, Brock’s 2000 Series Bin Sweep balances power and efficiency. Bin diameters: 30 to 78 feet (9.1 to 23.8 m). Auger diameters: 10 or 12 inches (254 or 305 mm). Capacities range up to 6,500 bushels (165 metric tons) per hour. See the 2000 Series Sweep video. 1000 Series Sweep - Intended for light to medium farm duty, Brock’s 1000 Series Bin Sweep offers zero-bin-entry safeguards for bins 15 to 60 feet (4.6 to 18.3 m) in diameter. Auger diameters: 8, 10 or 12 inches (203, 254 or 305 mm). Capacities range up to 10,000 bushels (254 metric tons) per hour. Click to see the 1000 Series Sweep video. 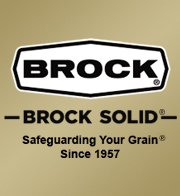 The flexibility and features of these Brock sweeps will help ensure that the Brock brand remains a trusted resource of solid reliability in grain handling.